The end of the dinosaurs, it was a true tragedy, especially for the giant reptiles. It all started with that nasty meteorite. At first, all the dinos agreed that they were having a bout of bad weather. As the days got colder the cold-blooded reptiles began to get nervous. Nesting spots near volcanoes became popular and certain dinosaurs took to the seas and started to evolve in the warmer oceans. The rest, as they say, is pre-history. 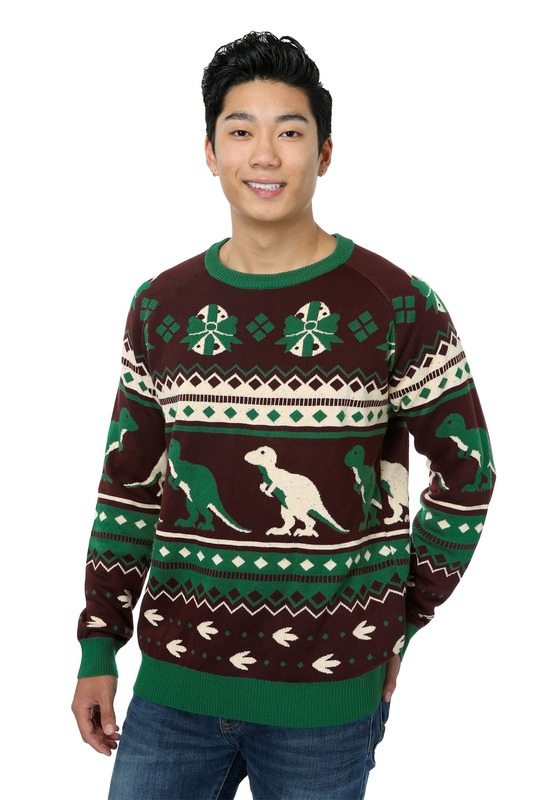 Perhaps if those poor lizards had a nice sweater more would have survived the oncoming ice age. While we do feel bad everyone should be grateful that we don't have to deal with the carnivores. Just imagine those roving gangs of raptors. Even the plant eaters would be quite a mess, just imagine what those stegosauruses would do to our crops! Say goodbye to your peas and carrots! So, while we're feeling those bittersweet thoughts we've got to celebrate those huge beasts during the holiday season. 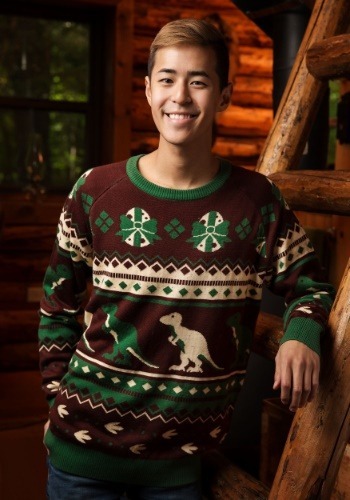 When you're wearing this holiday dinosaur sweater, raise a glass to those big beasts and while you're at it raise a glass to the ice age as well. While we might not like the ice and snow, we should be grateful we all don't have T-rexes for neighbors.